When Rudhyar unleashed Humanistic Astrology in 1969, it didn't come out of nowhere; rather, it was an approach to astrology he had been formulating since the 1930s. 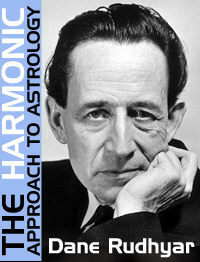 The Harmonic Approach to Astrology, from 1948, outlines a new approach to astrology - "a rose by another name . . ."
» From Humanistic to Transpersonal Astrology. » Concerning My Involvement with Astrology. » Astrology - Sacred and Profane. What makes a newborn child potentially different from all other children, with inherent tendencies of its own? To this question, various tentative answers have been suggested. The Indian philosopher, especially of the Buddhistic school, refers to skandhas, which he considers as the psychic and mental results of antecedent causes produced by the past actions of the child's reincarnating identity and as well of his ancestors, his race, his nation — the total karma of the past. The modern biologist discourses about "genes", mysterious entities in which are supposedly contained the seeds of human characteristics and tendencies which, when combined in various ways, come to form the biological and — at least to some extent — the psychic foundations of the child's particular body and personality. Fundamentally, the two points of view are similar, for whether the genes or skandhas refer essentially to physiological or to super-physical factors, the basic fact is that out of the immense storehouse of human potentialities, unconscious bio-psychic memories, racial and family peculiarities — all of which have been developed through the millions of years of mankind's past — a group of human traits have coalesced through a mysterious process of "selection", becoming the basis for the emergence of a particular organism — a newborn child. This child is, thus, endowed with a relatively unique set of tendencies, differentiated from the vast reservoir of mankind's entire past. The nature of the process of differentiation or selection remains so far a mystery. To attribute it to "chance" is merely to say that we know nothing and can never know anything about it. To give to "God" the responsibility for it is another way of admitting that it is a complete mystery to us; yet it also implies our deep feeling that there must be purpose in the process, and that some day, somehow, we may come to understand this purpose, either directly or by means of some divine revelation. In any case, we can say that the birth of a particular child represents a process according to which a relatively unique set of human traits and tendencies is produced, in some way selected out of trillions of such possible bio-psychic and elementary characteristics. The new individual organism emerges from the vast ocean of collective and ancestral human substance and thereafter develops in relative isolation from other organisms. This isolation produces problems and needs for the newborn — problems and needs which will change, as organic and psychological growth takes place in a more or less favorable environment, yet which will retain throughout the life a fairly permanent character. This character is the result of the particular combination of genes, skandhas or whatever it be, basic in the individual. The question to which we are seeking here to give an answer is: What is the relationship of the astrological birth-chart to this basic set of characteristics? Does the birth-chart define these characteristics, showing what is inherent in the newborn as an isolated organism with particular tendencies, problems and needs? Does it indicate the action upon the organism (body and soul) of external forces in the midst of which the child has chanced to be born? Or is it the symbol of a purposeful action of the universal spirit in an attempt to answer the needs of this new-born and to establish for him, in blueprints we might say, a solution to all his needs? Obviously, if any one of these three answers is considered by the astrologer or the person interested in astrology as essentially valid, his attitude towards anything connected with astrology will be thereby defined in no uncertain terms; and his interpretation of whatever data or concepts astrology presents to him will be different from the interpretations of persons who accepts, implicitly or deliberately, one of the other answers as correct. Today, in astrological circles, one or the other of the first two answers is believed to be true; and in a general way, both are considered as valid. Most people interested in astrology believe that the planets act in a physical or electro-magnetic way upon a human being, causing events to happen to him and defining the innate and characteristic tendencies of his "nature" as it is at birth. It is taken for granted, for instance, that a person whose chart reveals the Sun in Leo was born with an essentially warm, magnetic, generous, magnanimous, dramatic nature; that the summer Sun "made him that way" by virtue of its strong radiations, its warmth, etc. This approach to astrology poses not a few logical problems, paramount among which is the problem of why the Leo characteristics are apparently retained by people born in August in southern latitudes, when it is winter and cold. These problems, in our opinion, can only be answered if one considers astrology, frankly and without evasion, as the art of interpretation of celestial symbols, which are expressions of the spiritual purposefulness of the universe as a whole and of the creative activity of a universal God. From this point of view, the sky, as we human beings see it, is a manifestation of divine purpose. It is indeed an answer to human needs; and astrology is that activity of the human mind which enables us (potentially, at least) to decipher this answer. Intellectuals among astrologers will scorn such an attitude as being "mystical"; yet we contend that no one without bias can deny the fact that the universe we perceive is a strictly human universe, inasmuch as it is entirely limited and indeed defined by the character of our senses (which modern instruments only extend, but do not basically alter) and of our intellects organizing the raw data of sense-perceptions. According to so-called "modern thought", men are small bits of matter buffeted by universal energies and evolutionary tides; but to call this conception "factual" makes no sense at all. It is an interpretation of our relationship to the earth, the storms, the sky which our senses observe. Another interpretation, more constructive psychologically and, we believe, philosophically more significant, is that what we see, feel and hear of the world around us is what it is because we are what we are. It is a constant and consistent answer to our needs. This answer is directed to us because we see it. If we were different and thus had different needs — as generic human beings, first of all, but also as individuals or groups — we would find ourselves surrounded by a different universe, by a different set of answers from the universal harmony which we call God. Obviously, the universe of twentieth-century science is completely different from that of the Asiatic tribesmen of four thousand years ago, or even of modern Tibet. We and they see and understand the celestial world differently — that is, we give to our common experiences of the night sky different interpretations. Why is this so? It is because our human needs have become different. Our intellectual mentality, our restlessness as individuals, our increased desire for power-control, etc., constitute new needs; and we, therefore, find around us a new kind of universe that seems to satisfy these modern needs. Whether it actually satisfies them today is made highly questionable and doubtful by our suicidal wars and our overcrowded insane asylums. Modern physics and astronomy have surrounded us with a meaningless, purposeless and godless sky. Let us not try to analyze and criticize here the value of modern science's standard world conception, increasingly being challenged at present even by scientists themselves. The point to make is that for astrology to become subservient to the general astronomical concept of a meaningless and purposeless universe of blind electro-magnetic forces does not add an inch to its stature. It has everything to gain, on the other hand, from being the one practical and effective witness to a type of thinking which upholds the realization of purpose in the universe and which makes of the visible sky an intelligible manifestation of that purpose — a purpose which can be broadly defined as the constant (because essentially timeless) reestablishment of universal harmony everywhere. In terms of every-day astrological practice, this means that, because the birth-chart of a newborn child is the answer of the sky to the birth cry (which establishes the child as a relatively isolated organism with definite individualized needs and problems to solve), the birth-chart is actually a "horary chart" for the entire life of the individual. Any horary chart is an answer to the formulated need of an individual; and the more definite or vital this need, the more precise, clear and fitting is the answer outlined symbolically by the sky (i.e., by the horary chart). From our point of view, therefore, any astrological "birth-chart" has the character of a horary chart. What the birth-chart reveals is fundamentally not the innate nature of the newborn (and still less cosmic electro-magnetic waves beating upon his organism), but an answer to the needs of this nature. Thus, if a person is born with the Sun in Leo, it does not mean that he is by nature generous, warm, dramatic, eager for authority, etc. ; but, rather, his innate needs and problems as an individual will be solved by displaying these qualities. Such a time of birth (Sun in Leo) expresses the spiritual purpose of birth and what the person should do about it, but not primarily the nature of the particular combination of genes that defines his congenital nature. The task of astrology is not to analyze such a nature, but to interpret or decipher the purpose of birth and to formulate the basic solutions which the sky offers to all the needs and problems arising because of that birth. If such an approach is accepted as valid and true, then the whole orientation of the natal astrologer towards the charts he studies must necessarily change. Any birth-chart becomes an implied statement of purpose, a formula for the spiritual solution of bio-psychological problems. It contains no direct indication of events that must happen, of fateful developments, or even of "This is the way you are." On the contrary, it reveals the opportunities ahead, the way one can solve essential problems and re-establish a harmony which had been previously disturbed by a disharmonic separative action (Karma), whether the latter be considered as rooted in the past of a reincarnating entity or in the collective past of the race. In what we call here the "harmonic approach to astrology", a birth-chart is a formula for a process of harmonization. It, therefore, "complements" the stresses and emphases of the innate nature of the newborn; it does not represent them. As a result, if, for instance, Mars is strong in Scorpio in the birth-chart, this does not mean that the child was born with a strongly emphasized sexual-emotional nature; it rather means that his basic needs will be best answered by the type of activity represented by Mars in Scorpio. His task, therefore, is not to restrain an intense natural impulse related to Scorpio activity as much as it is to use this activity purposefully. "God" wants him to use it in a focal manner, for such a use will answer his congenital needs — his Karma. Likewise, if a child is born with many dynamic squares, this does not mean a tragic fate, but instead the fact that his needs demand for their solution a dynamic release of power compelling his self to embody itself concretely and powerfully into the outer personality. If trines predominate, this does not mean a happy-go-lucky, smooth temperament and existence, but the fact that the child should concentrate on developing the power of mind and of inner "vision" represented by the trine. It should be evident, nevertheless, that anything which shows what the answer to a need or the solution of a problem should be reveals at the same time, by implication and indirectly, what the need is. Nevertheless, the primary indication given by the birth-chart is the solution, not the problem; and the value and essential meaning of the chart do not arise from the astrologer's ability to see in it the problem, but instead the solution. For the astrologer to say to his client: "You have this and this fault. Your problem is such" — does not really help. What helps is to decipher for the client what he should do or understand in order to become a full, harmonic and spirit-expressing personality. To "express spirit" means here to work out and fulfill what the sky revealed at birth, for the total pattern of this natal sky shows forth the way of the spirit, the way to realize God's purpose in the birth, the "celestial" way. 1. There are no "good" or "bad" aspects, planets or zodiacal signs. Each aspect, planet or sign represents a solution to a human or organic need, a particular type or pattern of activity which is required in a particular case to produce a harmonious, balanced and mature personality. Personal maturity is the result of the conscious use by the individual of all factors shown in his birth-chart. No one factor is better or more valuable than any other. The whole chart, with all it contains, is the spirit's answer to the person's need. The "stars" are not to be "ruled"; they are to be used purposefully as indicators of the direction in which the life-energies and the powers of the soul and mind should be focalized actively. Squares are to be fulfilled, not shunned or bemoaned, simply because they are not "unfortunate" . . . except to the person who wants to cling to his ancestral past and just be "normal" and who shrinks from following the road of dynamic incorporation of self into the substance of the things which are his to do. 2. No birth-chart is "better" than any other. Every birth-chart serves its basic purpose, reveals what the newborn requires and the main points to which he should direct his attention. The solution for one kind of problem would be no solution whatsoever for some other problem. 3. While natal planets, aspects, angles, etc., indicate answers to congenital problems, it is possible also that the activities they represent can be over-worked, just as a man who has been given a deep sense of inferiority in youth often over-compensates for it by an attitude of proud and showy superiority. Thus, Mars and the Sun in Aries indicate that the individual should use initiative and start new things in order to solve the inner problem caused by a congenitally slow, static or over-peaceful combination of genes or Karma; but as the individual begins to exercise this Aries-type of power, which satisfies his need, he may become intoxicated with it and become a restless seeker for always new fields of activity, an adventurer or a Don Juan. As a result, a basically good and necessary orientation of energy will turn destructive by over-shooting the mark. Whether of not this will be the case can be guessed, sometimes with accuracy, by considering the balance and patterning of all the planets in relation to the houses; yet it can never be more than a guess because what an outside observer considers the overemphasis of a certain type of activity, energy or quality of feeling in the life of an individual may be the very thing that will serve "God's purpose" for this life. Franklin D. Roosevelt might conceivably have lived a life of ease and fortune, according to his ancestry and environment to his past. But he would not have solved his birth-problems. He used with utmost determination his retrograde tenth-house Mars, his fifth-and-sixth-house Sun-Venus-Mercury squared by Saturn-Neptune-Jupiter, his rising Uranus in order to stamp his ideals and his life purpose upon his times. These astrological factors, however, were not expressions of what he was born as; but rather the signature of his soul, of his archetypal being — that which the spirit brought to him as means to solve his own and his nation's Karma. They showed forcibly in his life, because he used them. Many people do not use theirs — and complain that "their charts do not work"! 4. What this all means, in terms of practical psychology, is that in every human person two factors or sets of factors have to be recognized. The first is the basic congenital need and "Karmic" nature of the new-born organism as an expression of the past. The second factor is the answer of the spirit (or God) to the needs and problems to which the individualization out of the past (that is, birth as a separate organism) gives rise. This can be called the "soul" or the spiritual archetype; and it represents the divine solution to the problems posited by birth and individualization. The soul is what can be seen of God by the individual. Likewise, the birth-chart is the whole sky as seen from the place and at the time of birth. It is the individualized sky, the "celestial" nature or name of the person, the answer of the universal whole to the disharmony produced by the separative act of birth; and it represents the future, for the future can always be considered as God's or Life's answer to the needs generated by the past. The personality as a whole is then the present, as it is the field of activity in which the creative pull of the future (celestial nature) seeks forever to overcome the inertia and the automatisms of the past (congenital nature, genes, Karma). The person we know as Mr. Paul Smith is a complex interweaving of his congenital nature, his celestial nature and of the reactions of the former to the latter — which reactions may produce new "needs" or new Karma, in turn summoning new answers from the spirit. If to the birth-chart (blueprints of the celestial nature) one adds progressions, directions and transits, a complex combination of astrological indications is produced which gives a very significant picture of the elements constituting this developing personality, for, just as the purpose of birth unfolds gradually, so the birth-chart can be "progressed" to meet, as an evolving celestial answer, the developing needs of human nature in a maturing, then disintegrating, natural organism. In any case, what astrology reveals is not a series of fated events, but a series of solutions to personal problems. God is the Healer. The sky reveals His healing remedies, not our illnesses. We can to some extent deduce the illnesses from the remedies offered; yet while the remedies are relatively few and they fall into basic simple categories (symbolized by planets, cusps, etc. ), the illnesses they may cure are many and varied. Thus, any one planetary and zodiacal configuration covers a large field of possible events or bio-psychological characteristics. To determine which of these many possibilities will require the celestial solution-remedy indicated in the chart or the progressions is actually an impossible task. It is, besides, a basically futile one. The Healer need only know what type of healing power will be required; the precise nature of the condition to be healed is of little importance to any one who knows that he has that very power which can heal this condition, whatever it be. Obviously, such an attitude runs counter to the basic orientation of our modern scientific civilization. What we care most to do nowadays is to analyze and to come to know "all about" wrong conditions, wars, failures, diseases and all types of evils which we make into entities. It seemingly matters little to us that as a result, people's consciousness become frightened by these evil entities of our own collective making. Ordinary evil is not an entity to be analyzed under microscope or intellectual analysis. It is merely an ancient failure, a crystallized inertial structure, a haunting memory or remorse, a constantly re-aroused fear to be dissipated, to be healed. It can be healed only by using healing power and the solution presented by the "sky within" (the astrological symbol of the sky all around us) — not by more fears, more toxins, more "electric shocks" or any such modern means which tend to force the evil inward by merely checking its outward release. We believe that astrology should be used and promulgated in order to give new vitality and convincing power to such a fundamental attitude to life and to the healing and whole-making spirit, the power of an ever-operative celestial harmony. Harmony and rhythmic, spirit-born order are the great healers, the only true restorers of equilibrium and peace. Who can fail to see that we need today their service more even than bread, for lack of bread is due to social conditions caused by wars, senseless competition, greed and jealousy — all forms of disharmony, separativeness and of the unrhythmic, unbalanced activity of individuals, groups and nations. But, alas, astrology, as used today, is but too often the arouser of more fear and the cause of deeper negativeness of thought or feeling. It is so because the approach to astrological concepts, data, symbols is turned upside down, as it were. The astrologer sees celestial factors as representing the past of the newborn (a particular combination of elements from the vast reservoir of human nature, Karma) — whereas what the sky reveals is the means to cure men from their pasts, the way to dissipate Karma by actions of a certain kind, the way to spiritual freedom, the healing way. Likewise, most psychologists are so intent on analyzing the personality as the result of hereditary and environmental influences — thus, as a combination of factors produced by the past of race and society, and re-focused in an individualized way in the new child — that they fail to consider what in man is the spiritual factor, the "soul". Only by utilizing this, the individual can overcome these collective influences. The soul is the archetypal purpose of man's personality, that which alone can heal and harmonize the inherited past and the tensions or complexes generated by a mostly disharmonious environment; it is our "celestial" being, of which the birth-chart is the symbol, the divine counterpart of our hereditary-environmental nature. The task of the astrologer, who has emerged from the superficial realm of fortune-telling and the negativity of the average student, is to evoke for his clients the healer within their nature, the celestial archetype whose power, when used, will make them whole.